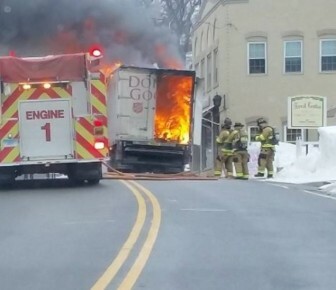 It isn’t clear what caused the fire in the “box” of a Salvation Army truck as it idled at a light on East Avenue just below Forest Street around noon Thursday. 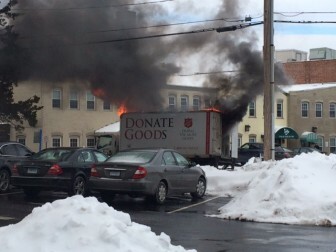 Around noon on Feb. 5, a fire erupted in the back of a Salvation Army truck on East Avenue, just below Forest Street. According to Fire Marshal Fred Baker, the drivers had picked up a load of household goods—clothing and furniture—in Weston earlier in the day, and had no idea how the fire started. “It appears to have started in the front of the ‘box,’ but there was too much destruction to determine a specific cause,” Baker said. No one was hurt in the blaze, officials say. New Canaan’s John Walsh said he was walking along East Avenue at 12 p.m. when the truck pulled up next to him and he glimpsed a flash of orange on top of it. Walsh let him know that their truck was on fire. The pair in the truck jumped out and found a mini-extinguisher. About six firefighters immediately responded to the truck fire, according to Lorenzo Colella, owner of Joe’s Pizza. Colella said he was leaving his Locust Avenue pizza place when he saw “puffs of black smoke” over toward Forest Street. “The firemen were starting to organize and you could see these puffs of smoke coming out of the back of the box, so it didn’t look like the motor,” Colella said. The fire department immediately was fully involved in its response and Baker also was summoned by command to the scene. Seth Berger, a 34-year volunteer firefighter in Stamford who owns Kids Home Furnishings around the corner, said he initially had thought someone had a bad oil burner when he spotted the smoke from his desk. When he went outside, he saw women screaming and the truck driver standing nearby. 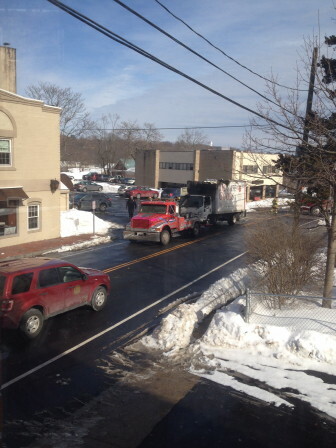 Berger said he asked whether the truck was in gear or if it’s emergency brake was on, and straightaway New Canaan’s firefighters arrived on scene to take over. In the minutes following the fire, a parking official blocked off East Avenue to traffic at one end and a police officer at the other, Berger said. The truck fire did not threaten overhead wires, Berger said. It was towed away around 1 p.m., he said.